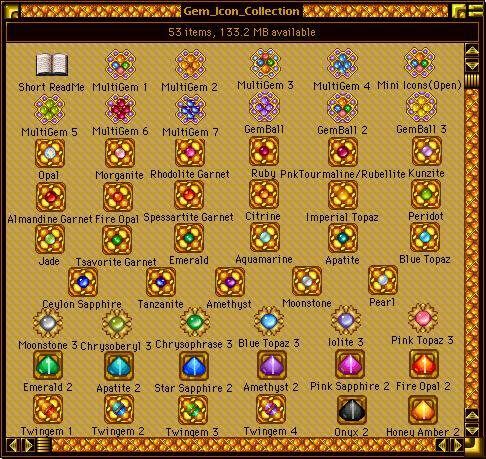 Freeware gemstone icons for you to download and use, but the copyright and all related rights remain mine. There are about 50 in the set; this is a small sample. To see the entire set, click: HERE. These icons were inspired by designs in my Kaleidoscope schemes. 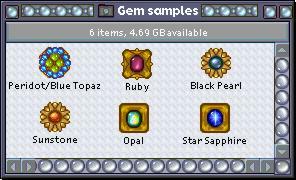 Another new freeware gemstone icon set for you to download and use, but the copyright and all related rights remain mine. There are 24 in this set; here is a small sample. If you liked the first set, you will like these. Enjoy! New fantasy icons, all hand-drawn, taken from my schemes. Sixteen icons, some adapted from drawings, some from photos. Click HERE to view and/or right-click individual animated fantasy icons. Eight animations. Also be sure to check out the holiday animations! Seashell icons in regular icon format, all hand-drawn. Nine icons, from my Seashell II Kaleidoscope scheme. Content © 1999-2005, Janet Snider Parris.